The Verifone P400, part of the Verifone Engage portfolio, leverages the latest Linux-based operating system for power and performance. Boasting a vibrant, colour display, this PIN pad enhances user experience with a design that’s as fast as it is stylish. Optional advanced commerce capabilities enable additional revenue streams at the point of sale via value-added services, customised for individual shoppers. Pair the P400 with a host device for a complete consumer-facing solution that will be reliable for years to come. Features an intuitive user interface with 3.5-inch colour touch screen and greater pixel resolution to accommodate the latest multimedia innovations. Accepts the full range of payment options and processes transactions quickly, for higher customer throughput and greater satisfaction. Delivers highly individualised offers and loyalty benefits to enhance engagement and revenue at the point of sale. Stunning touchscreen, nimble design, and app capabilities. Bring COLOUR to your business with a POS that emboldens your brand. Boasting a vibrant colour display, the P400 engages customers at the point of sale. 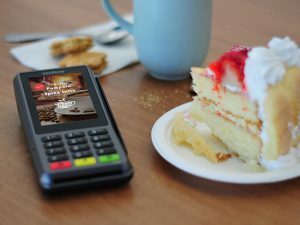 Pair the PIN pad with a host device for a seamless consumer-facing solution – that merchants can count on for years to come. Engineered for ultimate customer interaction and reliability with scratch resistant display glass. Angled display, tactile keypad, new user interface, and redesigned EMV slot for smoother card insertion make it comfortable and easy to operate. Bluetooth LE/Beacon capabilities allow for a more personalised experience. The Verifone P400 is available now direct from Secure Retail. Call us now on +44 (0)1530 511150 to find out how this can be integrated into your payment systems.